Location: Close to the S door of Jeffreyston Parish Church. A mediaeval preaching cross, exceptionally well preserved. In the early C19 it stood to a height of about 3m, but has since been reduced. When it was at its full height it was illustrated by the Tenby artist Charles Norris. Sir Stephen Glynne in 1867 refers to it as "entire". It was, however, subsequently broken and restored (before 1925) with the loss of about a metre of its height. As its chamfer stops just above socket level, as it should, it is probable that it is a mid-height section which has been lost. When re-erected the site of the cross was moved closer to the Church door. A stone cross, 2.1 m in height, but originally much taller. The sectional shape of the shaft is oblong with deep chamfers stopping close to the foot. The arms and head terminate in a slight hollow, which, with the rib created by the chamfering, create a bifurcated effect. In the W face just below the arms are two bronze bolt heads, and if this is where the break occurred the repair is very skilful. There is a socket-stone and two large steps. 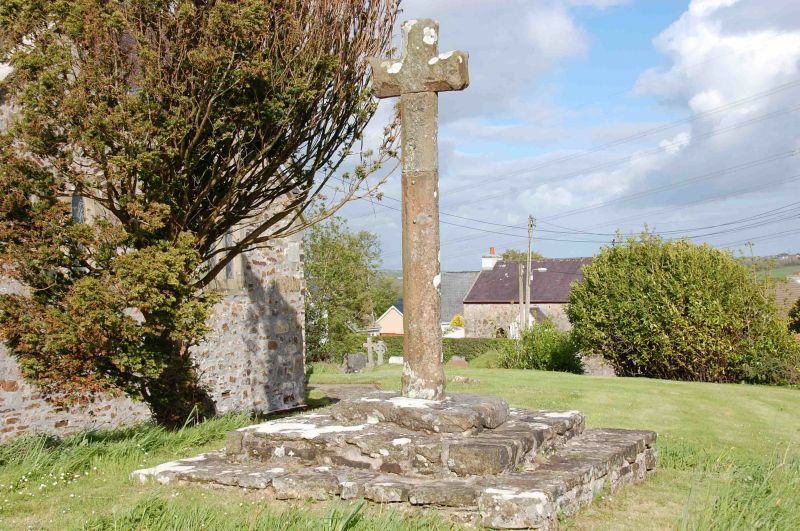 Listed as a well-restored preaching cross and for group value with Jeffreyston Church. At the N end of Ford Lane, 1 km N of Jeffreyston Village and 1 km SW of Reynalton Village. The bridge lies on the boundary of Kilgetty Begelly and Jeffreyston Communities. At the N end of Ford Lane, 1 km N of Jeffreyston Village and 1 km SW of Reynalton Village. The bridge lies on the boundary of Kilgetty/Begelly and Jeffreyston Communities. 2 km W of Begelly village and 1 km S of Reynalton village, on the unclassified road from Hackett to Langdon.